Life is full of questions and, clearly, there are far more questions than answers. Some people spend their lives in search of answers and others craft questions as a means of guiding their adventure. 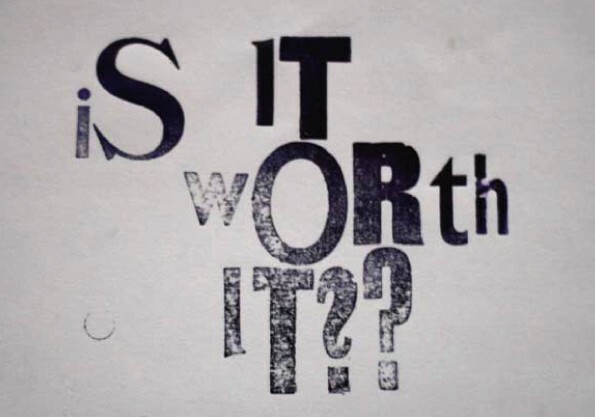 One of my favorite questions is, “Is it worth it?” It’s one of my favorites because it applies to any action we are about to take. It’s future oriented. A simple Yes tells us to take action and a simple No should be enough for us to move on without executing. I’d like to think that each of us who has deliberately decided to do something has purposefully pondered this question before taking action, but I know that is far from the case. Is that tuition bill worth it? Is sticking it out in a job you hate worth it? Is that next helping of cake worth it? Is telling others how you really feel worth it? Is following your dream worth it? I offer these questions not to give us reason to question what we have already (not) done, as the past is often best left in the past. The purpose is instead to give us reason to contemplate similar future decisions before we make them. I see many people investing time and money in things that they don’t necessarily believe in. They make investments yet execute in ways that undermine the potential for future returns. Meanwhile, I see others pouring their heart and soul into things that seem frivolous from an outsider’s perspective. Passionate people who are committed to a vision make amazing things happen. Despite the fact that they are continually questioned along the way, their commitment is clear. Meanwhile, others go through the motions blindly following a course charted by the expectations of others that leads to a destination that they themselves aren’t sure really exists. The individuals who identify with the former know the actions they take are worth it before they take them. Those who are more accurately described by the latter likely did not question the path before they took it, and yet, are surprised when they realize it wasn’t worth it. “Was it worth it?” is a very different question and one I tend not to ask myself. And if I find myself pondering that question, odds are the answer is No. I likely messed up in the execution of what I was previously committed to doing or maybe I wasn’t as committed as I thought. There are plenty of things in my life that didn’t work out as planned, there are decisions that I only half-heartedly made, and there were things that I have done that proved not to be worth it. That’s part of growing up, that’s part of life, that’s how many of us learn. Once we decide something is worth doing, it’s on us to make it worth it. Though we may choose to assess the value of our actions once we take them, we have no real reason to question ourselves after the fact. If we find ourselves asking the question in its past tense form, odds are we didn’t proactively reflect before taking action. If we decide something is worth doing, we must execute in such a way that preordains a positive answer when others ask us, “Was it worth it” It was worth it because we were committed to making it so. Is the way you will spend today worth it? Is the next investment you will make in yourself worth it? Is your relationship with (fill in the blank) worth it? If the answer to any of the above is No, then don’t do it. If the answer is Yes, do it, own it, and make it meaningful.